The DR Pro DR750 Speaker Stand is an intelligently designed, heavy-duty PA speaker stand that fits nearly every speaker cabinet on the market with a 1-1/2" or 1-3/8" socket. With its extra-wide base, the DR750 speaker stand can securely hold up to 150 lb.” which is more than enough for almost every applications. Play with complete peace of mind knowing that your music will fill the room but your speaker won't be going anywhere. The DR750 stand is made to last for years with a durable, black, powder-coated finish. 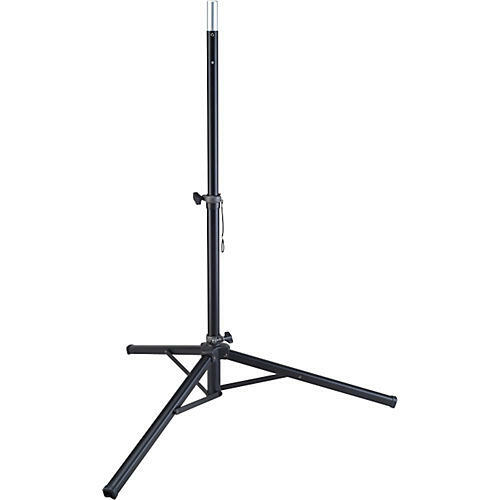 The speaker stand folds into a lightweight ultra-portable unit when not in use, and extends from 53" to 76" for a generous height range when in use. Stand height from 53" to 76"